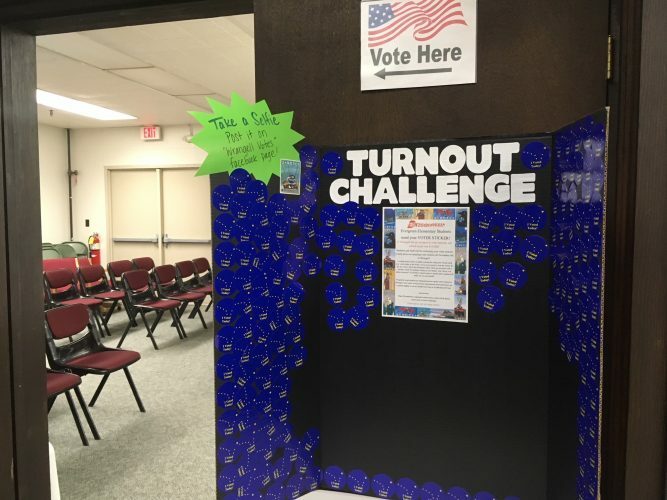 As part of the First Alaskans Institute voter turnout challenge, Wrangell’s elementary school is asking voters to leave their “I voted today” stickers on a poster board. A voter turnout initiative is getting kids from all over Alaska involved in today’s elections. The First Alaskans Institute will award thousands of dollars to schools and youth groups based on their communities’ voter turnout. And Wrangell’s elementary students are getting a closer look at the voting process through this challenge. Mikki Angerman is Wrangell’s kindergarten teacher. When she heard about the challenge, she used it as a teaching moment. “They’re really exploring what does it mean to have your voice heard,” Angerman said. She set up a vote in her own classroom. Third grade teacher Jenn Miller says she’s always discussed voting with her students. But this challenge got her and her fellow teachers fired up. And high stakes add some excitement to the mix. The First Alaskans Institute will award $10,000 to the top school or youth group in Alaska. Second place prize is $5,000. The challenge is based off of the community’s voter turnout percentage this year. The higher it is compared to the 2016 general election, the better chance for the kids. In Wrangell, 764 people cast a ballot in the 2016 election. That’s 44 percent of registered voters in town. Wrangell Cooperative Association Tribal Administrator Esther Ashton got the elementary school involved in this. And she says Wrangell has a unique history regarding voting, especially for Alaskan Natives. Charlie Jones, the sixth successor of Chief Shakes, was arrested while trying to vote in 1922, along with a Tlingit woman, Tillie Paul Tamaree. “They called on the first Alaskan Native attorney, William Paul, to represent them and they won the right to vote two years prior to other natives in the country,” Ashton said. The teachers have set up a Facebook page, “Wrangell Votes”, and are asking folks to take selfies of themselves voting. Kids are collecting “I voted today” stickers, pasting them on a poster board in city chambers. And it’s a known fact, kids and adults alike love stickers. “During the last local elections my students saw my sticker and were curious ‘Where did you go to do that?’” said second grade teacher Michelle Jenkins. She loved having that conversation with them in October. This time, she’s asking kids to go to the polls with their parents or other close adults. “I had some of my kids even come up today and say ‘We’re going to go! We’re going to go!’” she said. Kindergarten teacher Mrs. Angerman says the real thing is totally different than voting on cheeseburgers or pizza in class. “For them to see the actual polls themselves, and what the process looks like for an adult, it gets their mind set to where they could be doing that some day,” she said. Mrs. Miller says she’d like to see the money go towards a 3D-printer. The elementary school has a designated space for STEM education, and she wants to see more equipment and supplies put towards that. Schools interested in joining the challenge have until the end of Tuesday to apply with the First Alaskans Institute.